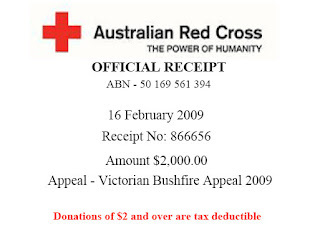 The 2009 Victorian Bushfire Fund to assist individuals and communities affected by devastating bushfires in Victoria has been launched by the Premier John Brumby in partnership with Red Cross and the Federal Government. 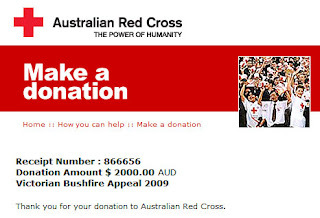 Queen Bee Maternity Pty Ltd has generously donated $2,000 to help families affected by this crisis. More than 180 lives lost with the number expected to increase as authorities access more homes and discover vehicles in which people attempted to escape the fires. Our biggest role now is personal support, offering assistance to people returning home and coming to terms with the magnitude of the disaster. Currently we are involved in the response phase providing temporary accommodation and food in 18 evacuation centres. We have registered more than 10,000 people in person, and provided thousands of first aid treatments. We have a team at Kinglake and Whittlesea helping with medical requirements, food and name registration so family and friends know they are safe and well. Our team is also offering personal support as this is going to be a very difficult time for people affected. People from around Australia and around the world are phoning through to our Inquiry Centre to check on family and friends. Volunteers who are trained in personal support are relaying heartwarming as well as heartbreaking, stories as the calls come in. Our Inquiry Centre has taken more than 17,000 enquiries with more than 11,000 people registered. Over 400 volunteers and staff continue to work in rotating shifts. Red Cross call centres in WA, ACT and NSW have opened to help deal with the volume of calls from people checking on the welfare of evacuees. Welcome to our Life Made Fabulous 2012 new year. We are so excited. 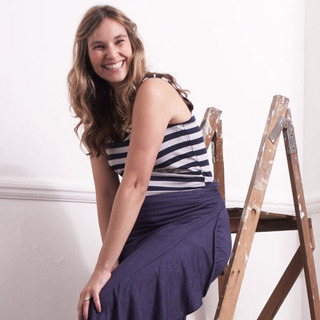 We have new designers joining our lovely maternity store and so many new styles and colours from all your favourite labels. We can't wait for them all to arrive so we can share them with you. 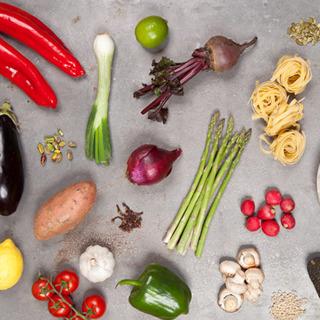 The thought of spending your Sunday afternoon figuring out the week’s dinner plan while standing trolley-to-trolley in a check-out line as long as your household to-do-list is as dreaded as it is unavoidable.